Indeed; Tyrian has now passed the SoV/C3V vote. Paronychodon, feel free to set up a "Book of ..." thread for Tyrian, or someone else can do it for you, and we will recruit the fine artists-in-residence of the C3V to make a dazzling card. When the card's up, please link it in this thread, and we will all swing into action to get the House of Links set up appropriately. I had reservations at first when I saw this nomination, but I voted yes, because Filthy did such a good job of “selling” him. Then it did not get enough “yes” votes and was denied induction. So Filthy re-submits with a better figure choice and a more interesting card, and Filthy again does another good job "selling" him. Points match up with the other Gladiators, and sine he helps friendly Gladiators, I can see why he is 100 instead of 90. Good job. Of course, this guy will be played with the Capuans and the rest of the Gladiators. But he can also be useful in a Hero Build of Gladiator Heroes. Since his taste of Freedom ability works on all Gladiators, combines with Crixus they make a nice duo. In One game there was a corridor blocked by a Fen Hydra and with the Combines abilities of One Shield Defense on Crixus and Priscus’ Taste of Freedom, the Hydra went down easier than I thought it would. The Grapple Speacial Attack adds a much needed SA to the gladiator ranks. He helps clear out Deathreavers, that are tyring to block a route, unless there is more than one rat to clear…then it slows down the Steamroller. Speaking of Steamroller, the Taste of Freedom is a nice ability that because of the OM component you have to decide it Spartacus is a viable option. I smaller point cost games, probably not…but in larger point cost games, you have to decide when Inspiration is important, or when ToF is important, or do you sacrifice a turn with the Capuans. At least, with Gladiator Bonding, keeping Priscus adjacent to the Capuans is fairly easy. In another game, Deathreavers were trying to block off the advance of the Gladiator Steamroller. Priscus would move up clear a rat with his SA and then the Capuans would move infron to protect him and once the way was cleared of rats, the ToF allowed the Capuans to have a better attack Value against Major Q10. I really like how that Grapple helped the Capuans succeed where they usually fail, and that is against the dreaded Scatter. Overall, this unit adds something new to the Gladiators and is very fun to play. Love the creativity and theme of this unit. 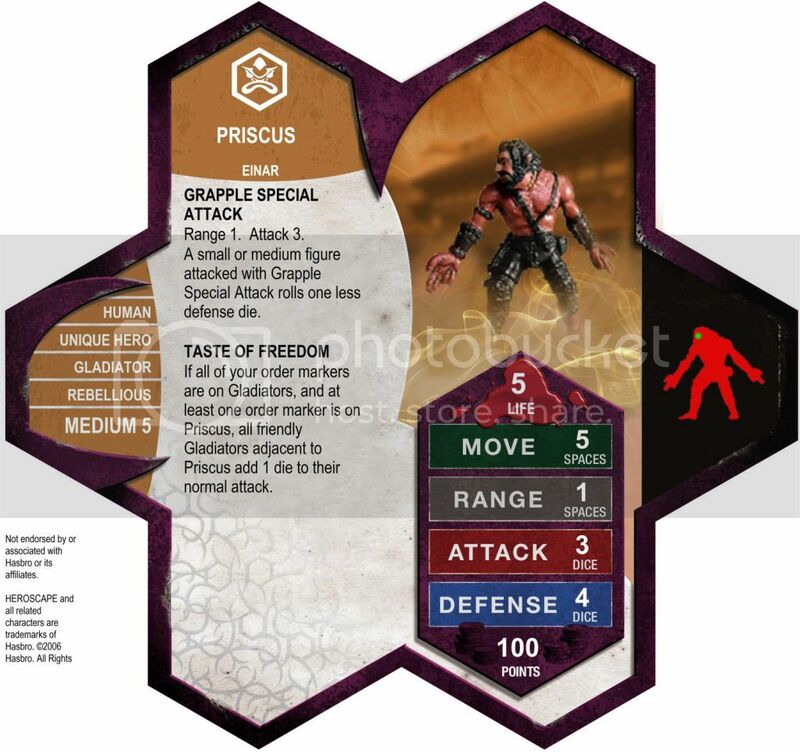 The figure does not have any weapons, but some Gladiators were known to be Grapplers so it works within the established Official Gladiators and adds a new wrinkle to the build. Well I found close to 50 on abprices so that meets my accessibility qualifications for a Unique Hero. Indeed. Great work on Tyrian! Thanks for creating him so well. Who in this world will sacrifice an expensive Protector of Ullar (that is to say an entire squad of Protectors) for this? Moreover, the card is far to be awesome. Anyways, the 2 others customs are great. Thanks you for this. And as we say in France: "Après la pluie, viens le beau temps!" Keep Up the Good work Soldiers! Last edited by Foudzing; January 24th, 2012 at 03:48 PM. Do you guys have a Curse of Ne-Gok-Sa equivalent over there on the french forums? Just curious. If it is a sort of game about Heroscape in a sub forum, yes we have! We have even more, as we embody Heroscape figures, our identities are masked, no one knows who is who. This is cool for alliances and treachery. Availability is important, but in the case of Tyrian he can be easily proxied just like the GenCon exclusives and Samuel Brown. BTW the ebay link is for a brand new, sealed box of protectors and dividers...I have seen many squads of protectors on ebay for $10. On that note you could use any protector for him, so if you went in with 2 friends then you could split the price and each have a repainted Tyrian. Anyway. Tyrian apparently does not appeal to everybody. I thought he was fantastic, but just as with official 'Scape, many figures do not appeal to everybody. That's ok, it's part of the game. Yeah, we have that version of CoN called the Masquerades about once a year during October. Last edited by MegaSilver; January 24th, 2012 at 07:32 PM. Guys, come on. Write pms or something. Have some respect. Just bought a bunch of the SoV units that are being reviewed and have to say that Gor'Vath's figure from Legendary Evils is an awesome figure. I can't wait to try a new Arrow Grut army with him. Also bought four squads of Beakface Sneaks for 5 dollars and change on Auggies! I love that. What other squad could you buy four for under six bucks? Cxurg'gyath's figure is also pretty amazing. The Legendary Encounters line from Reaper is continually surprising me. Really wishing I didn't have parent-teacher conferences or have to drive my brother's Uhaul from Oregon to Idaho. I just want to play some 'scape this weekend.